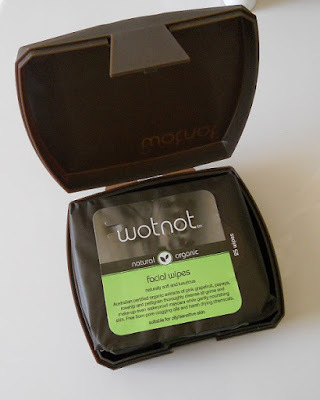 For a long time you could only buy the wotnot facial wipes online. But you can now find them in Priceline for $7.99 or with the travel case (like shown above) for $9.99. While it is very pricey for make-up wipes, personally I think it is so worth it. If in doubt wait for the 40% off skincare sale. The wipes are large, moist and very refreshing. They have an earthy type smell which is not off putting...I swear. So don't be afraid if you're sensitive to smells. Not only are these wipes made up of amazing ingredients but they do the job and do it well. I wear light to medium make-up on my face and more medium-heavy eye make-up. And I find that these wipes remove about 95% of my make-up using only one wipe. I've tried a few wipes before and none have performed like these. I love that there is an option to buy it with a travel case it's just added way to make sure the wipes stay moist and it also has a mirror at the bottom as an added bonus. Overall I would highly highly recommend these wipes. What are your favourite facial wipes? Its amazing that these have Rosehip in them, its so great for the skin!